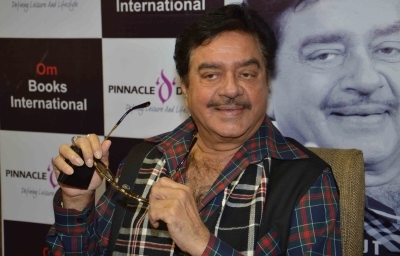 Mumbai, Oct 30 (IANS) Former actor and BJP leader Shatrughan Sinha has extended his support to actor Vijays Tamil film “Mersal”, which had some controversial dialogues about GST and the Digital India programme. He says people should support the movie and not remain defensive about the “perfectly legitimate issue”. “Why are we so defensive about a perfectly legitimate issue that has been raised in the Tamil film regarding healthcare and the GST? As entertainers and actors with powerful voices we have a certain duty towards the public to make them aware of socio-political issues,” Sinha, who’s is a BJP member of Parliament from Patna, said. “Mersal” was embroiled in controversy after the Tamil Nadu unit of the Bharatiya Janata Party (BJP) demanded the removal of certain dialogues which take a dig at the Goods and Services Tax (GST) and Digital India. However, Sinha feels that the protestors of the movie don’t represent the BJP’s official view. “Has anyone heard the Prime Minister (Narendra Modi) or any of the top leaders commenting on the issue? It is only some elements in our party who are eager to prove that they are more loyal than the others,” Sinha said. “They are the ones jumping in to attack this perfectly harmless and very significant point raised in the film. Instead of attacking Vijay and questioning his credentials we should all take his words seriously and work towards improving healthcare in our country,” he added. Sinha feels there is no harm in pulling up the government for mistakes. “We should gracefully accept that demonetisation was a mistake. I was one of the first to point it out that it was not right. So many have lost their jobs, all their savings. Likewise perhaps even the GST is not what it was meant to be,” he said. “If so, let’s admit out mistake, let’s roll back. Let’s not be ashamed to say we are sorry. Instead of attacking actors and artistes for drawing attention to anomalies in the workings of our democracy, we should applaud them. Valid criticism must be equally welcome from Amar, Akbar and Anthony,” he added. He believes that the film has received a lot of hype because of BJP. “Thanks to all the noise that was made over a few dialogues in the film by my overzealous party members, the film has attracted much more attention that it would have otherwise. The makers of ‘Mersal’ must be thankful to the BJP,” he concluded.